The Private Attorney Involvement (PAI) Program, also known as the PAI Volunteer Lawyers Project, was initiated as a pilot project in 1982 by the Volunteer Lawyers Project of The Florida Bar. Attorneys may also become members of the Partners in Service Program. 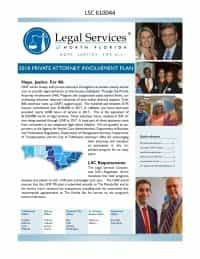 The “Partners” Program gives government or private attorneys and law firms an opportunity to contribute money annually to support LSNF activities while fulfilling The Florida Bar’s Pro Bono Rule.